Here is the truth - every wedding costs money. It is up to the couple to balance two things: their expectations and their budget. Let me offer two truths in the world o' weddings. First, at the end of the day, the couple for spent hundreds and the couple who spent thousands have this in common. Truth #1: They are both married, ready to live happily ever after. And as a wedding photographer, let me share with you my philosophy and approach to a small wedding. Truth #2: A small wedding is no less important than a big one. Thus, I was delighted to photograph the wedding of Kristen and Chris. You may remember them from their unique engagement session at their gym where both are weightlifters. Their wedding took place on the shores of Melton Lake Park in Oak Ridge. A simple arbor against a gorgeous backdrop provided by Mother Nature. Mother Nature also provided a day that was hot. No, really hot. And sunny. But honestly, so what? With a short ceremony, any discomfort was momentary. What was important was that Kristen and Chris had those who loved them present to witness their marriage. And their friends and kin did just that. 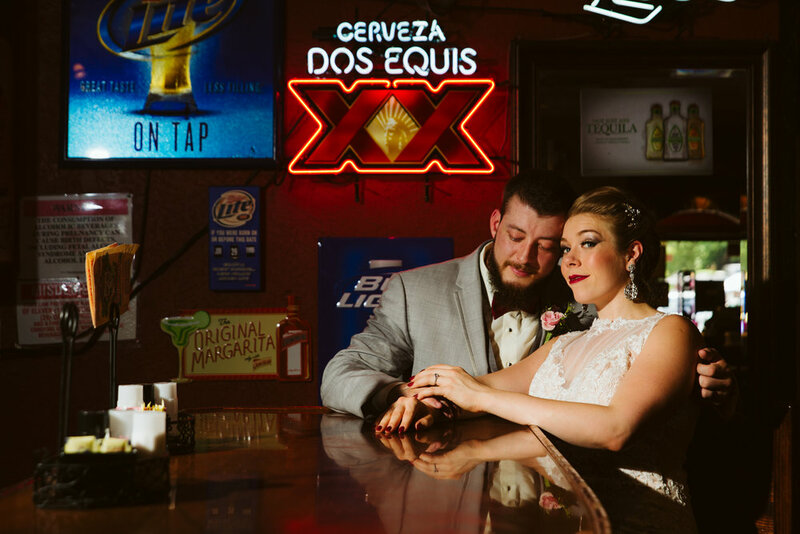 And the ceremony was followed by a luncheon at a local restaurant, Hacienda Degollado (and if you don't like Mexican food, what is wrong with you?). For me, it posed a challenge - how to do bridal portraits on a day with a blazing sun and no shade, and in a busy commercial area. But hey, if you are not challenged at your work, where's the fun? Fortunately, the restaurant had a small bar with a nicely polished counter and a back patio with a beautifully textured red wall. Let's go! I offer a smaller package designed for what is more of a courthouse wedding or an elopement because cutting down on size does not have to mean cutting down on quality. Professional wedding photography can come in a smaller package - but just as jewelry from Tiffanys does, right? It all comes down to the day being what the couple wants. Forget traditions. Forget bridal magazines telling you what your "must haves" are. Just keep my two truths above in mind and make it your own. It will be special and I can help make it that. Shout out to Kelly Myers for his assisting me in the heat of the day.